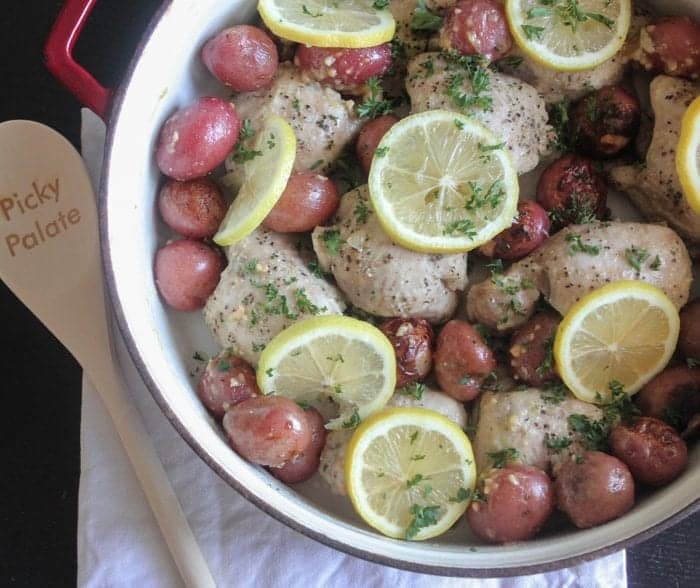 Pan Roasted Garlic Lemon Chicken Thighs is flavor packed with amazing garlic lemon and herbs. This is a gorgeous plus delicious dinner! My Pan Roasted Garlic Lemon Chicken Thighs recipe is about to be a regular Sunday dinner in your home! I’ve got an epic family dinner recipe for you today! So simple to prepare and packed with great flavor. 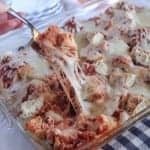 We had this for Sunday dinner and I’ll be making it again very soon. Enjoy friends! Can I Use Other Chicken Parts? 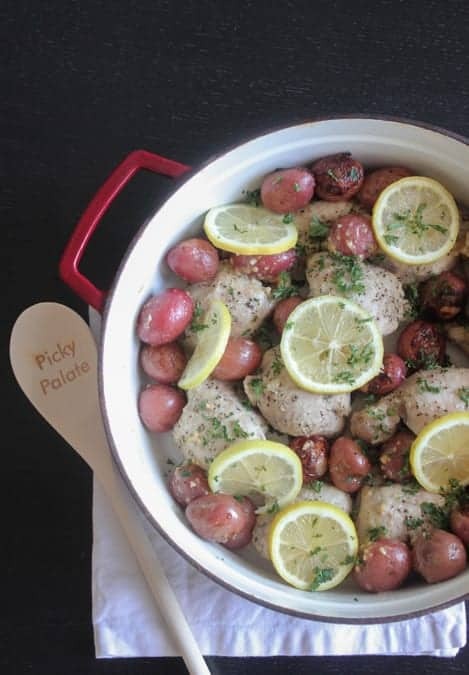 You can use chicken breast or even chicken tenders for my Pan Roasted Garlic Lemon Chicken Thighs. Adjust the cook time accordingly. 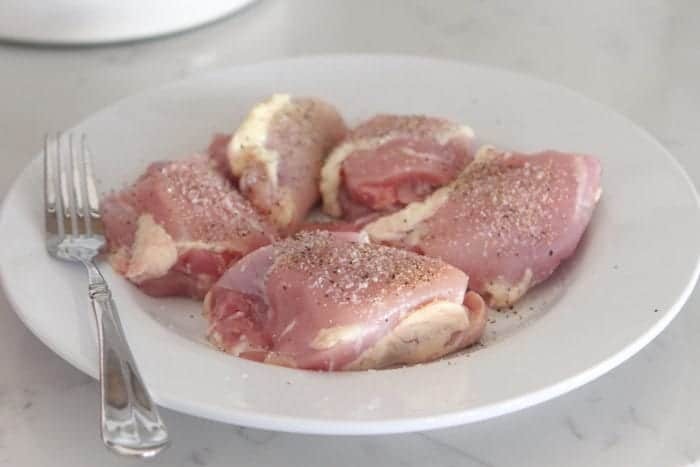 I used chicken boneless skinless chicken thighs, technically you can use whatever chicken parts you’d like, just adjust the cooking time according to what you choose. Breasts would take longer, tenderloins less. You get the idea. 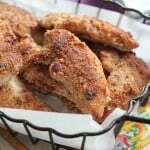 Why Should I Use Chicken Thighs? Chicken thighs are a great substitute for chicken breast. 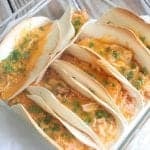 You can grill and sauté them just like breasts, but they really shine in stews and braises, where long, moist cooking can easily overcook and toughen chicken breast meat. Chicken thighs have nice sections of easily accessible, tender meat. When the oil is hot, saute minced garlic for just a few seconds before you add the chicken thighs. 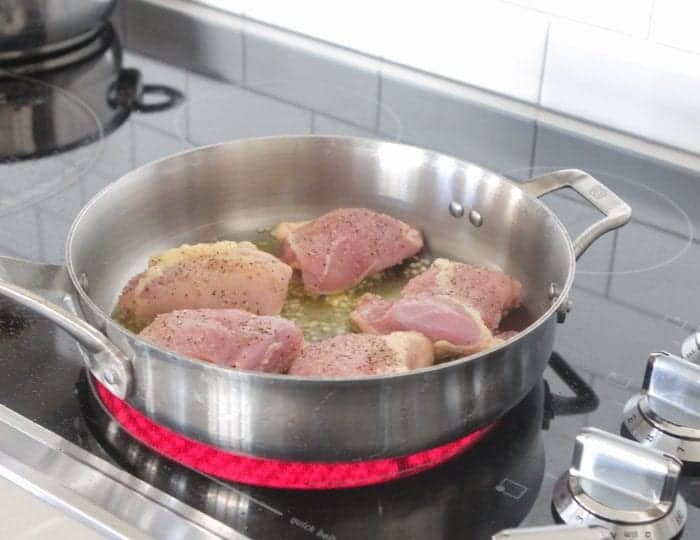 Place about 5 chicken thighs per large skillet and let cook for 10 minutes then cover with lid for another 20 minutes. Add baby red potatoes to the open spaces. 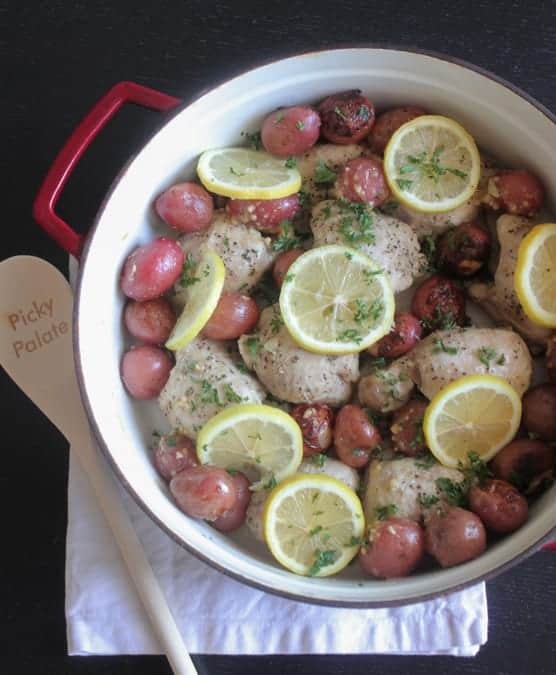 Remove lid and squeeze lemon juice over chicken and potatoes then top with lemon slices and chopped parsley. Cover lid and bake for another 20-30 minutes before serving. Serve with crusty bread and a nice green salad. 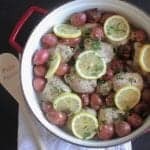 *This recipe makes a beautiful Sunday Dinner. Serve straight from roasting pan. *Feel free to substitute chicken breasts or chicken tenders for the thighs if desired. Adjust cook time when needed. *Add baby carrots and cut celery to pot for more vegetables if desired. *Serve with a chef salad and crusty bread. Heat oil in 2 large skillets over medium heat. 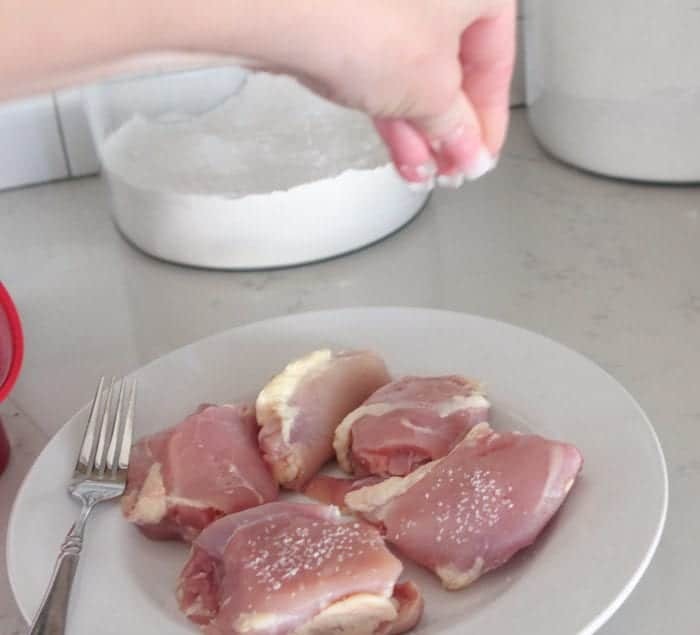 Season thighs with salt and pepper. 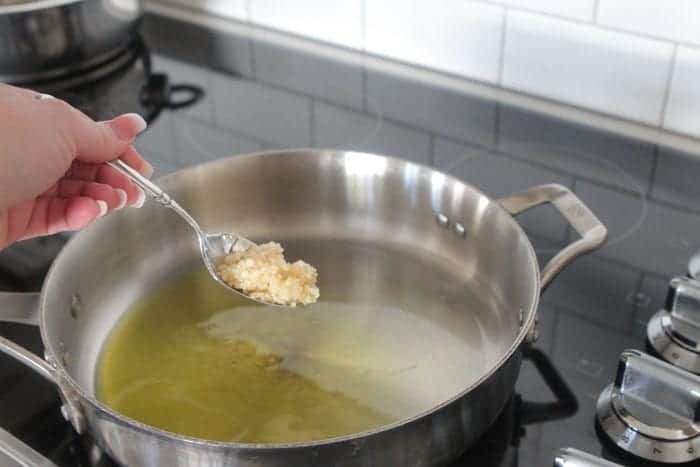 Add garlic to oil and stir for 30 seconds. Add chicken and let cook for 10 minutes. Cover with lid and cook for an additional 20 minutes. Preheat oven to 325 degrees F. Remove lid and add baby potatoes to open spaces. 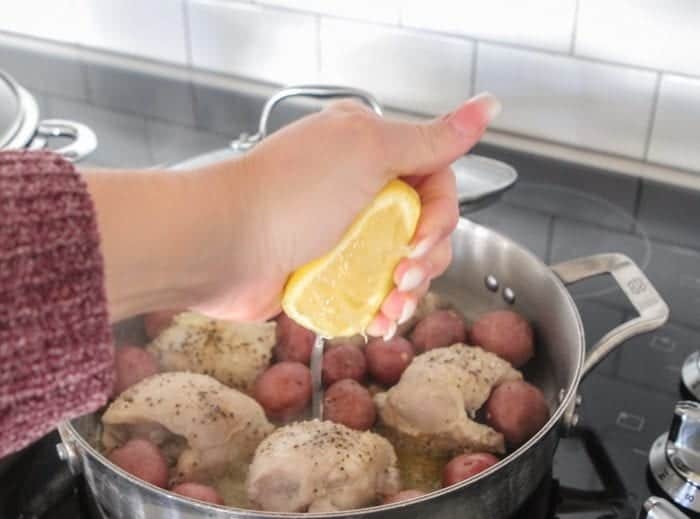 Squeeze tops of chicken and potatoes with lemon juice. Close with lid and bake for 20-30 minutes. Serve warm with crusty bread and a green salad. very nice decoration, party view and delicious. It’s very easy to make and very tasty. Look easy to do. So delicious. I need to do it now. Can’t wait to try this recipe! Thank you for sharing! Chicken thigh is all times favorite in my family. An outstanding share! I’ve just forwarded this onto a colleague who had been conducting a little homework on this. And he, in fact, ordered me dinner due to the fact that I found it for him… lol. So allow me to reword this… Thanks for the meal!! But yeah, thanx for spending the time to talk about this topic here on your internet site. Looks really delicious. I love the lemon touch to it. thank you so much for this article .In past when i am not use this then in that time i was not know about this but when i start use this site then i know about the game. and finally i start us this .really what game friends. just try it and take you also benefit. I am a bit confused as to why you say to use 2 skillets? It looks as though the thighs will all fit into one skillet and no mention is made of the 2nd one in the directions. Recipe looks good.